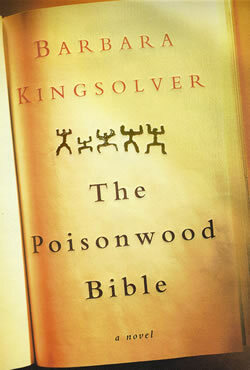 Told from five different points of view, The Poisonwood Bible incorporates the cultural arrogance of the United States with the ancient traditions of a Congolese village. During the 1950s, a radical Baptist minister, Nathan Price, brings his family to Africa in order to save the “unenlightened” souls of the Congolese. His four daughters, Rachel, Leah, Adah, and Ruth May, narrate the novel in the present tense with varying attitudes towards their new life. His wife, Orleanna, however, tells her side of the story as though grieving over past events, creating foreshadowing for the reader. The oldest daughter, Rachel, is a materialistic teenager who hates her new life, while her younger sisters are excited, though each for their own reasons. Leah, for example, is overly enthused, like her father, at the prospect of welcoming more souls into their newly established Baptist church, while her twin sister Adah, a cripple and mute, silently observes her new surroundings with interest, though slightly detached from the rest of her family. The youngest Price daughter, Ruth May, quickly becomes friends with the children of the village and spends hours exploring the surrounding area. The conversion of the villagers to the Baptist faith proves difficult, and Nathan Price faces many challenges in the old traditions and blasphemous (according to Reverent Price) rituals of the Congolese. He and the chief have several disagreements on the incorporation of Jesus into the Congolese faith. Meanwhile, the Price family begins to grow apart due to their varying faith convictions, and the headstrong Leah butts heads with her father over many issues. Amidst all these familial battles, the battle for the independence of the country is taking place, causing anxiety for the whole village. It appears as though the Price family, who hoped to stay in the country for at most a year, will have to stay longer due to tensions between the United States and the Congo. Dry spells, disease, violence, and the death of one of the Price family members threaten to widen the divide between the women of the Price family and Nathan Price. This story is breathtakingly beautiful in its storytelling, and incorporates the many aspects of light versus dark, religious intolerance, familial relations and love, growing up, the ideas of individuality and true justice, as well as many other universal themes. Kingsolver creates many wonderful and three-dimensional characters for the reader to enjoy, including many villagers, a CIA operative pilot, a foulmouthed parrot, the six-toed religious leader of the village, and a young schoolteacher, with whom Leah falls in love. The story itself is a political allegory that focuses on the point the author wishes to make clear to all: the guilt that all citizens of the United States share when violence is done and they “sit passively by”. The author, Barbara Kingsolver, expertly handled the story’s plot and situation, almost as if she had been there herself (which she hadn’t). Personally, I loved the book, and it seems to be a feel-good story, in its own way. For those who didn’t like Cry, the Beloved Country, trust me, this is completely different (I would know, because I really didn’t like Cry, the Beloved Country). I would give this novel five stars, for sure, because it often made me close the book and think about our society today, and how we must respond to crises similar to the ones in this book. RECOMMENDED.